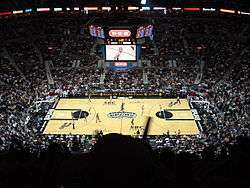 The 2003–04 NBA season was the 58th season of the National Basketball Association. The season ended with the Detroit Pistons defeating the Los Angeles Lakers 4-1 in the 2004 NBA Finals. This was the final season for the original two-division format in both the Eastern and Western Conferences, before each of the conferences added a third division the following season. As a result, this would also be the final season for the NBA Midwest Division, as the Minnesota Timberwolves were that division's last champion. The All-Star Game was held at the Staples Center in Los Angeles. The West won 136-132; Lakers center Shaquille O'Neal is named Most Valuable Player. For the first time in 21 years the Portland Trail Blazers did not make the playoffs, ending the second longest streak in NBA history. For the first time in 20 years the Utah Jazz did not make the playoffs, ending the third longest streak in NBA history. Prior to the start of the season, Karl Malone and Gary Payton took major paycuts to leave their teams and join Kobe Bryant and Shaquille O'Neal on the Lakers for a chance at a possible NBA title. However, that title chase came to an end in the NBA Finals, as the Detroit Pistons won 4-1. Behind their "Big Three" of Kevin Garnett, Latrell Sprewell, and Sam Cassell, the Minnesota Timberwolves amassed the best record in the Western Conference, and were expected to finally win a first round playoff series. They won two and advanced to the Western Conference Finals, which they lost to the Lakers. It would be their last playoff appearance, beginning a playoff drought that as of 2016 has lasted for twelve years. LeBron James (1st overall to Cleveland), Carmelo Anthony (3rd overall to Denver), Chris Bosh (4th overall to Toronto), and Dwyane Wade (5th overall to Miami), among others, formed one of the strongest drafts in NBA history. Among the highly touted rookies, Anthony and Wade led their teams to the playoffs, and Wade's play pushed the Heat into the second round. James went on to win NBA Rookie of the Year. Anthony became the first NBA rookie to lead a playoff team in scoring since David Robinson of the San Antonio Spurs during the 1989–90 season. Tracy McGrady was the first scoring leader since Bernard King in 1984–85 whose team did not make the playoffs. Los Angeles Clippers Dennis Johnson Mike Dunleavy, Sr.